Yorkshire captain Andrew Gale is hoping that the Leeds floodlights and a later start will create a special buzz around Headingley when the Vikings begin their NatWest Blast t20 campaign against the Derbyshire Falcons on Friday evening. “I’m very excited about the start of the t20 here on Friday,” said Gale. “After three or four weeks of playing four-day cricket it will be nice to put on the coloureds again and get out there with the white ball in front of a decent crowd and entertain the public. However, Gale is hoping that his team enjoys more success in short-form cricket than they did in 2014 when they finished fifth in the North Division and failed to qualify for the quarter-finals. “It’s definitely a format in which we are looking to make improvements and I thought we did make some strides last year,” he said. “But a club like Yorkshire should be looking to get to Finals Day more regularly than we have done. Spectators arriving for the game, which begins at 7pm, will be hoping to see Jonny Bairstow reproduce some of the power hitting he displayed in making a century against Hampshire in this week’s Division One game. However, Gale is pleased that, England and IPL calls excepted, he has a full squad of players available for the eagerly awaited match. “We don’t have Glenn Maxwell here yet because he’s still with the IPL,” he said. 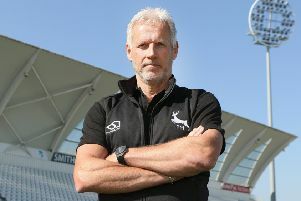 “But Andrew Hodd has come back into the fold and will probably open the batting, so we’re at full strength apart from the England lads and Glenn. Yorkshire squad: Gale (capt. ), Bairstow, Bresnan, Brooks, Fisher, Hodd, Leaning, Lees, Patterson, Plunkett, Pyrah, Rashid, Rhodes.